HEPAC2 - From one of the Pioneers for Animal free Testing.Standardized, validated, long-term human hepatocyte cultures. Already in 2008, PRIMACYT received the research prize of the German Ministry of Food, Agriculture and Consumer Protection for the achievement in developing methods to reduce the number of animal experiments. Human hepato cultures are regarded as the gold standard in cell culture techniques for the evaluation of hepatic drug metabolism pharmacokinetics, toxicity and other xenobiotics as well as biological, pharmacological and toxicological studies. Drugs and chemicals may have effects on the human body. A long-term chemically defined and repetitively usable cell culture system has to be employed for screening and assaying. PRIMACYT is one of the pioneers in the development of such advanced in vitro modeling systems. The HEPAC2 human hepatocyte culture system is chemically defined, standardized and validated. For maintaining characteristic functions of the human liver, long-term in vitro viability and functionality of human hepatocytes in test tubes can be ensured for at least several weeks. We support your cell culture experience with human hepatocytes. Human hepatocytes are cultured on collagen-coated plates in the presence of HHMM, our Human Hepatocyte Maintenance Medium. Maintaining liver specific function, such as cytochrome P450 activities, ammonia detoxification or blood synthesis, allow repetitive screening of drug-mediated changes on hepatocellular functions including their long-term effects. No need to employ genetically modified human hepatocyte cells or cell lines. Gain in research as time critical availability of donor tissue is at least reduced. Improved ethical R&D standards as the use of laboratory animals can be reduced to minimum. PRIMACYT is your research partner for fresh and cryopreserved human hepatocytes, ready-to use animal component free Human Hepatocyte Maintenance Medium, Human Hepatocyte Growth Factor and related other reagents, media and cell culture plasticware. Cytochrome P4501A2 associated Ethoxyresorufin-O-deethylase activity (EROD, left) and cytochrome P4503A4 associated Testosterone-6ß-hydroxylase (T6H, right) activity can be induced repeatedly in human hepatocytes cultured with PRIMACYT Human Hepatocyte Maintenance Medium. Human hepatocytes cultured serum-free can be used for a predefined period to study expression and induction of enzymes and membrane transport proteins involved in drug metabolism. We have implemented a standard protocol that allows the repeated use of human hepatocytes for several cycles of drug analyses, as long the substance(s) of interest or its metabolites are non toxic (see below). MC, arrows = medium change. Human hepatocytes are cultured for 4 days with daily medium changes. On day 4, the first incubation cycle is started and hepatocytes are incubated with the substance(s) of interest for up to 24 hours. After 24 hours the medium is changed and the cells are cultured in the absence of assay substance(s) for 72 hours. The incubation cycle is repeated every 4 days on day 8, 12, 16 etc. Use of acetaminophen (APAP) as a model substance to establish HEPAC2 as a reusable hepatocyte culture system. Human hepatocytes were cultured in HHMM. Medium was changed every 24 hours. Albumin was detected in cell culture medium. At indicated days, acetaminophen was added for 24 hours. Albumin release before, during and after incubation with APAP was determined in the culture medium. 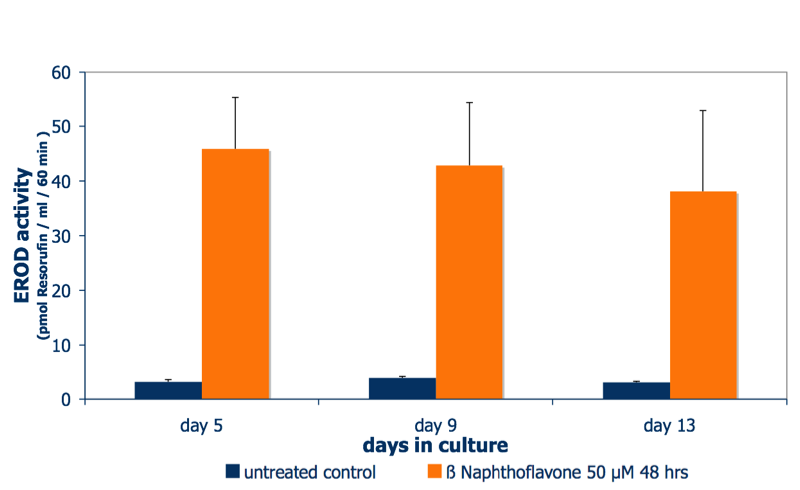 During each incubation cycle APAP reduced albumin release by 60-70%. This effect was reversible, within 3 days albumin release returned to normal control levels. The incubation cycle could be performed 4 times, each time APAP reduced albumin release by about 65 %.